Apologies for the lack of posts lately, but I have been busy during the last few months of summer. This is a one man show, so I’ve been trying to convince myself to write more posts. On to the more exciting news: on my most recent vacation, I was able to make time for a bit of fly fishing! Any time I find myself near a place that has even a remote potential of being a trout habitat, I have to fit in time for fishing. This time was no different. I’ve never been west of Tennessee, so I was excited for the opportunity to visit this part of the country. The Olympic peninsula is about 3 hours outside of Seattle and is home to a wide array of habitats. We visited the rocky coast to peer into tide pools, spot whales and sea otters along the shore, and hiked through a rain forest in the same 50 square miles. The entire area was extremely dry due to a drought, but the mountain rivers were cool and clear. We happened to stay near the Calawah River one night, so I walked down to the stream one morning to check it out. I tried a couple of runs and noticed a few small fish rising at the tail end of a riffle. I cast a size 24 gray parachute adams to see if there would be any takers. After a few misses… fish on! Or was it? It ended up being such a small cutthroat, that I hardly registered the weight of the fish. I decided to walk down the river a bit to find another spot to fish. The original path I took down to the river ended at a large and deep pool, but I had a feeling this section was heavily fished due to the ease of access. While walking downstream, I stumbled upon a section of fast water that dumped into a more shallow pool and decided to give it a shot. I think a lot of people tend to avoid fast moving water when trout fishing, which is exactly why I migrate towards it. 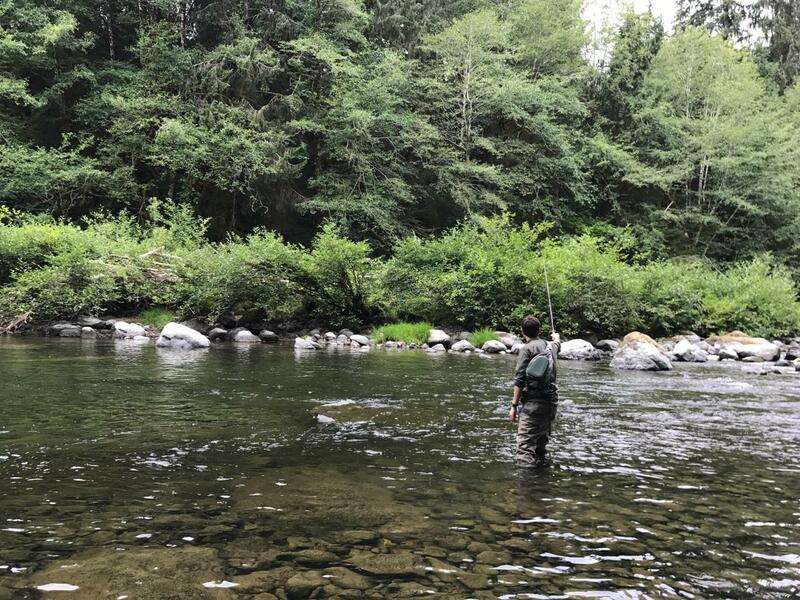 You can’t always be sure that you’ll find trout there, but I’d say your chances are good if you can locate a deep channel in a river. The fast moving water keeps fish hidden from view with the added bonus of plenty of bugs and nutrients flowing towards them at a fast rate. Also, one of the best things you can do for yourself as an angler is to not limit yourself to one technique. I remind myself of this all the time, and have developed a few tricks to allow myself more freedom on the river. 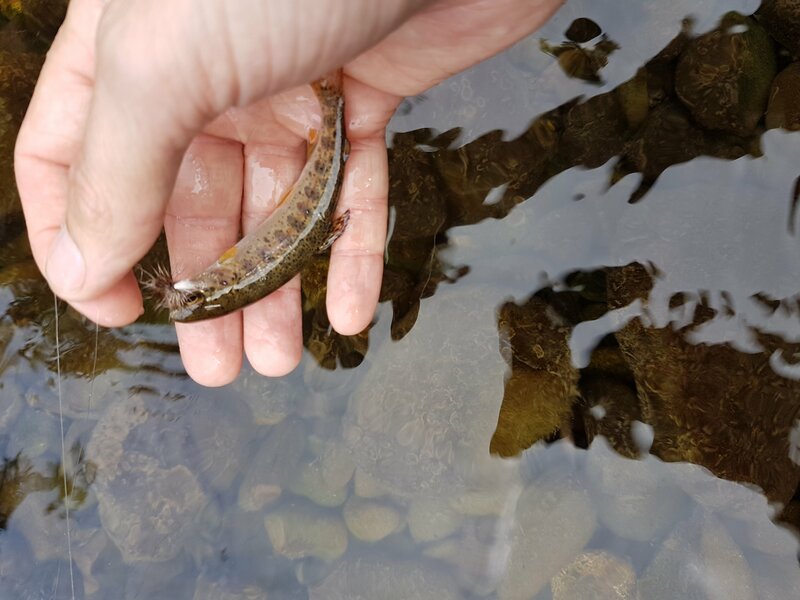 I think by deciding that you are a “dry fly” or “Nymph” person, you are really limiting your prospects. 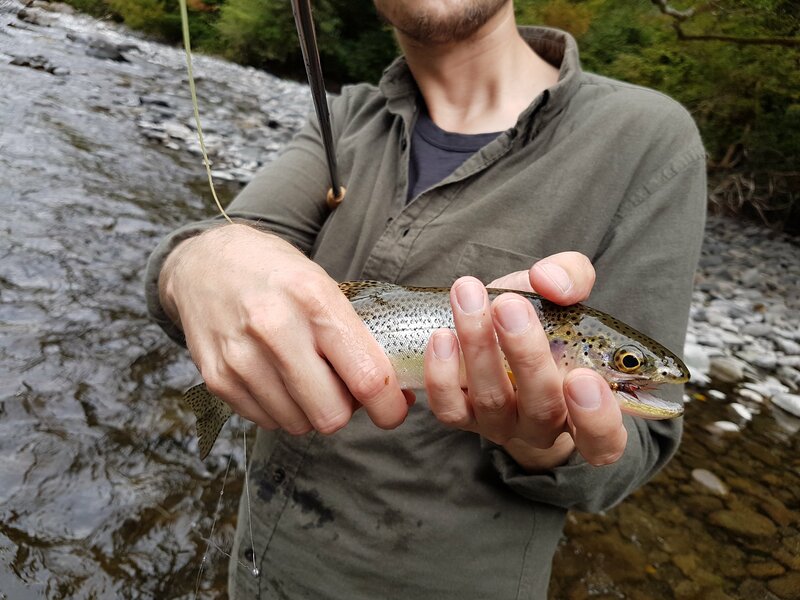 At the first spot, I used a dry + dropper, and at the second, I decided to tight line nymph. For this method, I tied on a yellow caddis nymph, with a red and black stonefly nymph as the anchor fly. A couple casts into tight lining the channel; I felt a nice tug and set the hook. It was a short fight, and that fish was gone! After catching between 5-10 trout out of the second spot, I had a hunch that the deep pool just upstream couldn’t be void of fish. I decided to switch tactics once more, and tied on the chunky streamer I tied a few months ago. A few casts into it, and I had a big hit. I knew whatever had taken the streamer was much bigger that the 8-12″ trout I had been catching, and was excited to see what it might be. After giving the 4 weight a work out, I finally brought a much larger cutthroat to the net. All in all, it was a great trip. If you’re ever headed to the olympic peninsula, I’d definitely recommend taking a day to hang out with a few of its wild river residents. Depending on timing, I hear there’s also amazing steelhead and coho fishing. I hope one day I can check that out, but this was a nice self-guided and low key outing.